Isla of Axholme - a blog about me, my knitting and other woolly things. Hello everyone. I hope the sun is shining where you are! In my last post I mentioned that I was starting a new business hence why I had been quiet. I thought I would share with you what I am doing and what that means for Isla of Axholme. My new venture is an online wool shop called BritYarn. It hasn't opened yet but everyday I am ticking things of my list and getting a step closer. BritYarn will specialise and only sell wool grown in Great Britain with the aim of promoting and supporting British businesses. If you are interested in knitting, crochet or weaving it would be great to continue chatting over on Twitter @brityarn and on Instagram again as BritYarn. If social media is not your thing I will also be writing a BritYarn blog (I will post a link here to my first BritYarn post). A lot of my posts here were knitting and wool related and in the future they will appear in BritYarn's blog. Unfortunately this means that there will be spells when Isla of Axholme goes quiet. I hope to continue sharing what books I have been reading and my travels but at the moment I am not doing much of either! Hello! I am still here....... those that follow my old Twitter account are aware that I am in the middle of launching my new business. Of course its woolly related and things have been super busy. I will tell you more on my next post but if you want to find out more now you can follow me on Twitter and Instagram @BritYarn. 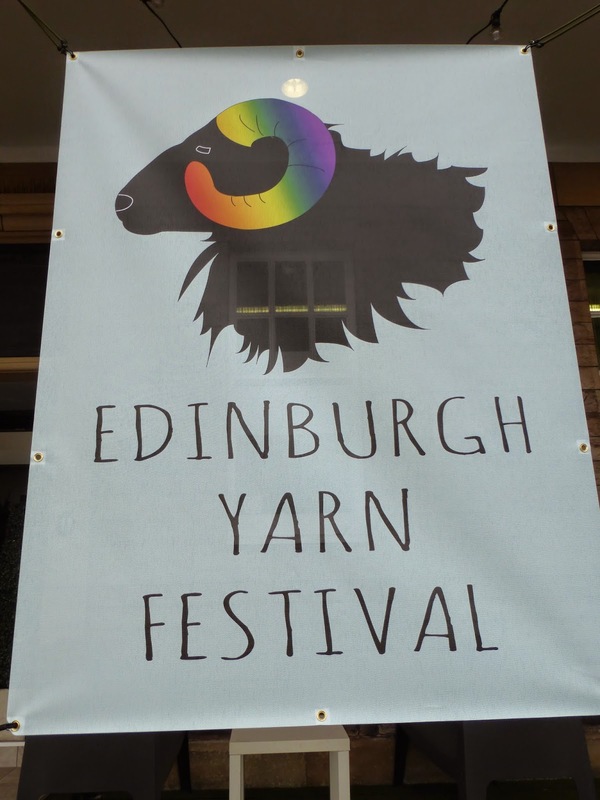 Anyway Edinburgh Yarn Festival 2015 (EYF15) was brilliant! Myself and my best friend traveled up by train (1st class no less) on the Friday morning, dropped our bags off and spent the afternoon exploring some of the sights of Edinburgh. We walked around the castle area, said hello to Greyfriars Bobby, popped into several vintage shops and had a coffee in the tea rooms where J K Rowling allegedly wrote Harry Potter (interesting toilets). We spent the evening with fellow knitting friends (some we had met before others we knew through Ravelry and Twitter) in a gin bar! After fuelling up on a grand breakfast we headed to the Corn Exchange where EYF was being held. The market hall was buzzing when we walked in! It was really busy and in my usual style I got carried away looking and purchasing and forget to take any photos! As we were there for two days we did take our time and took several breaks during the course of the day in the Podcaster Lounge hosted by Louise of the Knit British podcast and blog. Over the course of the weekend Louise had arranged a really interesting lineup including guest spots. Unfortunately I seemed to miss them all but I did get to squish her British wool samples! After a day spent shopping we had the evening party to look forward to hosted by Felicity Ford of KNITSONIK. Felicity gave a interesting talk on knitting and her new book The Standard Colourwork Sourcebook. She even gave us a tune on her accordion which was accompanied by a flock of sheep (sounds of not in person!). Following that there was door prizes (I won one!!) and a quiz. Sunday was a day of learning and relaxing. I attended a colourwork workshop held by the famous Hazel Tindall where I started a wrist warmer. I am pleased to say that I finished it on the train journey home. Several weeks later I continue to look at it with pride! A little light shopping was done in the afternoon but the majority of the afternoon was spent chatting to friends in the Podcaster Lounge. It was an amazing weekend and I am pleased to say that the organisers have announced dates for next year 18-19th March 2016 with classes starting on the 17th March. February has been a busy knitting month with several projects finished! I am very happy to say that I have finished knitting my Vivid blanket and they are blocking as I type! It is for our new niece although I want to keep it for myself now!! I am such a bad auntie!!! At the end of January I cast off my Kunye shawl which I made as part of The Golden Skein's 1st birthday celebrations. Towards the end it was slow going as the rows were really long and I was using the smallest crochet hook I have ever seen for the beading. It looks and feels very glamorous. The plan is to wear it at the Edinburgh Yarn Festival Ca-Baa-Ret party in March. Also started in December and finished this month, my Rosthwaite socks by Louise Tilbrook. I really enjoyed knitting these and mastered my first afterthought heel!! I am definitely an afterthought heel convert. I am itching to cast on some new socks but I have promised Mr D that I will get his second sock started........soon. Enabled by fellow Edinburgh Yarn Festival attendees I started my Owls Jumper by Kate Davies. I have wanted to knit myself one for ages so I didn't need much encouragement! I am using New Lanark Chunky which I bought when we stayed at the mill last November. I have finished the main body section and arm number one. The plan is for it to be part of my Edinburgh Yarn Festival wardrobe! Last but no means least my best friend and cast on the Lapsang hat by Clare Devine. We decided we would have matching hats for Edinburgh (in pattern only). I rummaged in my stash and picked out some Texere Olympia I bought at Yarndale in 2013. I have one skien left so I plan to knit the matching cowl. As you can tell I am super excited about going to Edinburgh next month! We are going for the weekend so plenty of time for wool purchases, chatting to fellow knitters in the Podcast Lounge and learning new skills (I am booked on Hazel Tindall's Fair Isle Class). Are you going to Edinburgh? Let me know! If you are not able to make it I will tell you about it on my return. I want to share these photos with you all. They are crochet doilies which belonged to Mr D's Gran who sadly passed away just after Christmas. I feel very honoured to have them in our home. As far as we know Gran didn't make them herself (she was a keen knitter, sewed and embroidered). We think they may have been madeby my father in laws auntie. Whoever made them must have loved to crochet. The stitches in some of them are so tiny and the yarn so thin. The table runner alone but have taken many hours of work to create something of that size and detail (there are 80 squares). It was great to join with Laura and other like minded folks in the #theyearinbooks Twitter chat last month. Laura posed some thought provoking and at times pretty tough questions and the hour flew by. In January I finished Robert Harris's An Officer and a Spy. I found this book really interesting and loved reading it. As I mentioned last month the book tells the story of the Dreyfus Affair. While I have not had the opportunity to fully compare the novel to the facts I understand that it largely adheres to the truth. It is a pretty shocking story including the lengths people would go to in the belief they had acted correctly and how others attempt to put things right. If you like your history novels or just fancy trying something different that I heartedly recommend An Officer and a Spy. I have also been reading a knitting pattern book. To non knitters this will be of no interest so I will keep this brief. I was very lucky to receive Kate Davies new book Yokes (which contains 11 yoke patterns) for Christmas. The first half of the book explores the background and origins of the circular yoke. I found it a fascinating read and learnt so much about the yoke design and the stories of those who designed, made and wore them. My February read is Grayson Perry's Playing in the Gallery. It is not quite a year since I finished my degree so thought it was about time I started to include some non fiction into my life again! I plan to alternate between non fiction and fiction books this year to get a healthy balance. Last week I decided that I would make a batch of marmalade! Not sure why I came to this decision, my track record for jams and chutneys isn't great. So while doing the weekly shop last week a bag of seville oranges ended up in the trolley. The following day I set to work squeezing the oranges and chopping them up ready for their overnight soak. I totally underestimated how long and how difficult it would be to thinly slice a kilo of oranges. I tea break was called half way through. I used the marmalade recipe from River Cottage Handbook Preserves using their Sliced Fruit method. Like the River Cottage Bread book there are lots of helpful tips to guide jam and chutney novices like myself along the way. I have to say it was a total success!!! I had a few problems reaching the setting point but that was down to me not using a big enough gas ring (I was being cautious following an indent with burnt apricot jam a few years ago!). It got the seal of approval the following day from Mr D!